Surrounded by fragrant olive trees and overlooking vineyards, mountains and the sea, Camping dei Fiori offers the setting for a cosy, relaxing and great family holiday. Just 600 metres from a beautiful sandy beach, the campsite offers a beautiful swimming pool complex and fun facilities for the youngest of the family. 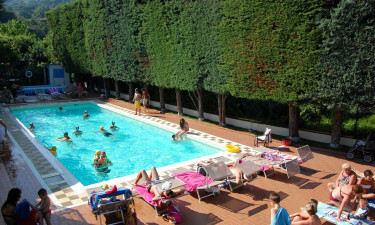 When traveling to the Italian Riviera, Camping Dei Fiori will offer you a wealth of good facilities. The beautiful pool area offers pure relaxation and water sports. Here you can enjoy the sun in the swimming pool or on the sun loungers on the sun terrace, and for the family's youngest there is a children's pool for free. A walk of just 600 meters and you reach a lovely sandy beach at Pietra Ligure. The children's club organizes creative activities for the little ones, and for evening entertainment there will be everything from magic shows, to dancing, to theme nights for the whole family. 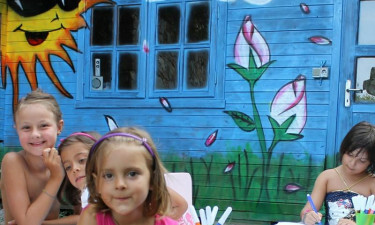 Camping dei Fiori will provide a lot of fun and activity for all ages. You can throw yourself in archery, dance or riding, and if you want to take a closer look at the natural surroundings, you can rent mountain bikes at the campsite. For the brave souls, Camping dei Fiori offers paragliding or climbing, and even at the beach, Camping dei Fiori will do their utmost to make you have a fun and memorable holiday. Become good friends with the wind with windsurfing or sailing or exploring the depths of the sea and discovering fish and plants closest to diving.